Stakes are high and growth is possible, but how can lenders corral elusive borrowers? 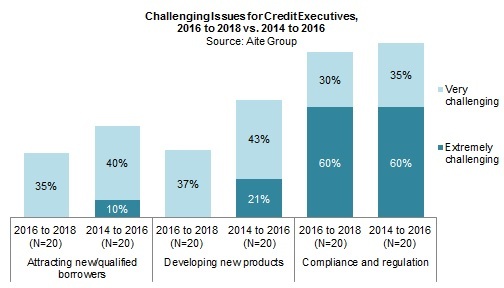 Boston, June 2, 2016 – Since 2011, Aite Group has fielded a biennial survey with lending executives from leading U.S. retail credit providers. This year’s survey reveals that despite lack of consumer loan demand, struggles to return the credit portfolio to profitability, and unrelenting regulatory concentration and confusion, executives have emerged from the recent past with new energy, products, plans, and increasing budgets. These riders aren't dropping the reins anytime soon. Based on an Aite Group Q4 2015 to Q1 2016 survey of top 50 U.S. consumer and commercial lending institutions, this research reveals challenges and opportunities as seen through lenders’ eyes. It compares individual institutions’ progress with strategic plans and forward directions for 2016 to 2018, and it is the first in a two-part series about the U.S. retail credit market. This 27-page Impact Note contains 13 figures and two tables. Clients of Aite Group’s Retail Banking & Payments service can download this report.